Tackle Guru, Korda’s subsidiary brand of innovative match & specimen angling tackle is already a big player within that side of the industry. It was clear that it needed a website to match that ethos. 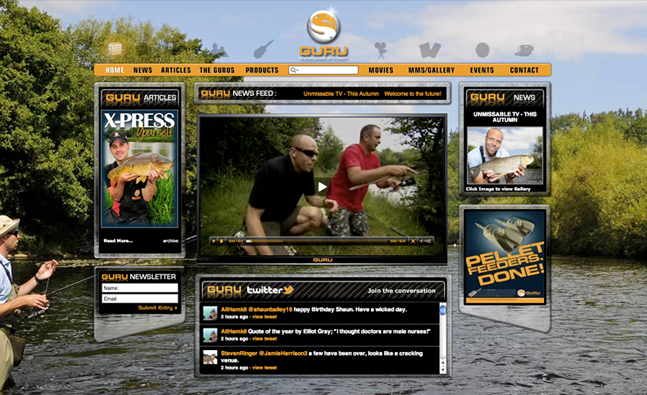 iAngler created a website in keeping with the structure of the current Korda theme, along with the same great usability and functionality which made that site so popular. It was surprising how much changing a new colour scheme did to the site, as I’m sure you’ll agree it looks like a whole different site altogether! As match fishing doesn’t always warrant a whole news piece, we integrated a news ticker feed at the top of the homepage so match results can be posted, regardless of whether we had any additional photography. It’s only just launched, but its sure to follow in Korda’s footsteps in setting the example of how fishing sites should be!